From the “wonderfully talented” (Dwight Garner, New York Times) author of Mislaid and The Wallcreeper comes a fierce and audaciously funny new novel, dazzling in its energy and ambition: a story of obsession, idealism, and ownership, centered around a young woman who inherits her bohemian father’s childhood home. Recent business school graduate Penny Baker has rebelled against her family her whole life-by being the conventional one. Her mother, Amalia, was a member of an Amazonian tribe called the Kogi; her much older father, Norm, long ago attained cult-like deity status among a certain group of aging hippies while operating a ‘healing center’ in New Jersey. And she’s never felt particularly close to her much-older half-brothers from Norm’s previous marriage-one wickedly charming and obscenely rich (but mostly just wicked), one a photographer on a distant tropical island. But all that changes when her father dies, and Penny inherits his childhood home in New Jersey. She goes to investigate the property and finds it not overgrown and abandoned, but rather occupied by a group of friendly anarchist squatters whom she finds unexpectedly charming, and who have renamed the property Nicotine House. The residents of Nicotine House (defenders of smokers’ rights) possess the type of passion and fervor Penny feels she’s desperately lacking, and the other squatter houses in the neighborhood provide a sense of community Penny’s never felt before, and she soon moves into a nearby residence, becoming enmeshed in the political fervor and commitment of her fellow squatters. As the Baker family’s lives begin to converge around the fate of the Nicotine House, Penny grows ever bolder and more desperate to protect it-and its residents-until a fateful night when a reckless confrontation between her old family and her new one changes everything. 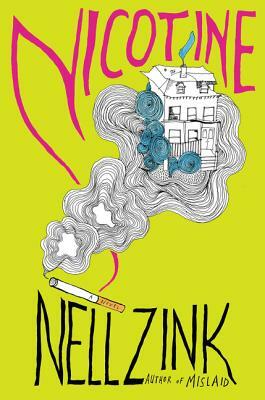 Nell Zink grew up in rural Virginia. She has worked in a variety of trades, including masonry and technical writing. In the early 1990s, she edited an indie rock fanzine. Her books include The Wallcreeper, Mislaid, Private Novelist, and Nicotine, and her writing has appeared in n+1, Granta, and Harper’s. She lives near Berlin, Germany.